The first time I used a computer was 1964, when I sent computation task to our company's computer department to be run with their Elliot 803 computer, which was acquired 3 years earlier. I got the results after a few days. Only one person in turn could use Elliot and only one run in turn could be made. The input and output were done via a 5 channel punched paper tape. No mass storage was available. The results were punched to a paper tape and were then converted to paper via a teleprinter. The programming language was Algol. The computer used germanium transistors and had a ferrite core memory in 8192 words of 40 bits, 39 bits of data with parity. At the beginning of 70's it was possible to use computers interactively with time-sharing, which was a big step forward. Our computer was a Honeywell Bull 6000 series computer and the user interface was provided by a Nokia teletypewriter terminal (left). In addition to time-sharing use, it was also possible to start batch jobs from the user terminals. Fortran and Basic were available for designers. The terminal operated at a maximum speed of 10 characters per second, corresponding to a transmission speed of 110 bauds. 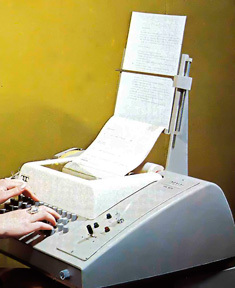 It was equipped with a paper tape reader and punch, which operated at 10 characters per second. At that time I was doing microwave frequency electronics design and calculated the circuit performance with the aid of self made Basic programs. The program had to be read to the computer from a paper tape and punched back to a tape after possible changes.One thing which I learnt well was line editing, because one had to change the program by replacing the character strings of one line in turn.